Olynda Smith is a seasoned yoga teacher, a Montessori early childhood teacher, a writer and a mama. Yoga Olynda began her yoga journey 15 years ago as a way to heal from the wear and tear from years of dancing and capoeira. She found physical healing for those injuries, and a beautiful path that has supported deep healing and growth. 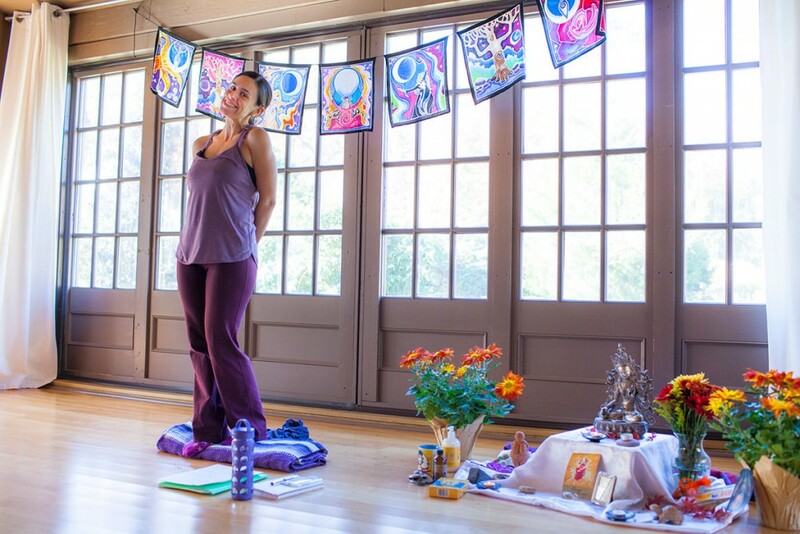 She fell in love with the practice of yoga and began teaching in 2002, after completeing the Asheville Yoga Center’s 200 hour teacher training. Committed to learn the best teaching skills possible, by 2011 she had earned two of the highest certifications in the field: Anusara Certification and an Experienced 500-hour Yoga Alliance Certification. With nearly 15 years of yoga teaching experience, Olynda is a very versatile teacher and is able to guide new yoga students as well as inspire and challenge students who have been practicing for many years. She is very able to work with students who are working through injuries, having logged many hours of therapeutic yoga training. In every class she brings the philosophy and spiritual teachings of yoga to life in a grounded and usable way. As a big myth-geek and spiritual seeker she’s delved into the studies of the Divine Feminine. She took that study deeper through the Evolutionary Goddess course with Sally Kempton and Andrew Harvey in 2015. She loves cultivating a safe supportive sacred space for women to gather, practice yoga, be nourished and investigate a feminine awakening. She does this through her women’s retreats. Work with Parents/ Kids Alongside her study of yoga, Olynda has also been studying the fine art of being with children. She has taught nearly every age group, and in many different settings. She spent 7 years teaching in the Montessori environment and is a certified Montessori Early Childhood teacher (ages 2.5 – 6). She developed and ran her own home-based, bilingual, Montessori program in Brooklyn. Currently she teaches yoga to Upper and Middle school students at the Carolina Friends School. Olynda is also a Simplicity Parenting Family Life Coach. She brings to her work with parents a rich background in different parenting styles, educational practices and most of all a deep respect for all parents and children. Writing Several of Olynda’s articles about spirituality, yoga and work with children have appeared in Montessori Life Magazine. Big thanks to Kallyn Boener for being the amazing Photographer who took most of the pictures on this site! Check her website here.